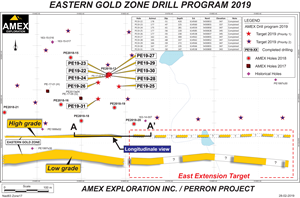 MONTREAL, Feb. 27, 2019 (GLOBE NEWSWIRE) -- Amex Exploration Inc. (“Amex or the Company”) (AMX: TSX-V; FRA: MX0) is very pleased to announce that ongoing drilling of the Eastern Gold Zone (“EGZ”) at the Perron project (“Perron”) has successfully intersected additional high grade gold mineralization in the first lateral step-out program on the High Grade Zone ("HGZ") of the EGZ. 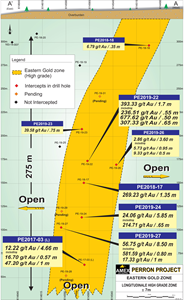 Drill hole PE-19-27 intersected 56.75 g/t Au over 8.50 m including 581.59 g/t Au over 0.80 m (see Table 1) at a vertical depth of ~225 m and a lateral distance of ~25 m to the East from the previously defined vertical section of the High Grade Zone (see fig. 1 and 2). The intersected mineralization consists of two quartz veins located on either side of a foliated and fine grained mafic intrusive crosscutting a large unit of silicified rhyolite. The upper quartz vein returned a value of 17.33 g/t Au over 1.0 m and the lower quartz vein returned 581.59 g/t Au over 0.80 m. Each of these two quartz veins contains pyrite, sphalerite, and numerous visible gold as coarse grains, flakes, or points. An additional step out drill hole, PE-19-26, intersected the two quartz veins on both sides of the mafic intrusive with values of 5.73 g/t Au over 0.95 m and 9.33 g/t Au over 0.50 m (see Table 1) at a vertical depth of ~160 m, but this time at a lateral distance of ~25 m to the West of the previously defined vertical section of the High Grade Zone (see fig 2). A minimum lateral width of 50 metres has now been confirmed with the results from PE-19-26 and PE-19-27 as well as from visual indicators from additional unreleased holes (assays pending). The zone has now been intersected over a vertical distance of approximately 150 metres and a lateral distance of 50 metres pierce point to pierce point with a spacing varying from 25 to 50 metres. The High Grade Zone extends to a depth of approximately 275 metres below surface and remains open towards surface, to depth, and along strike. In addition to these results, the Company wishes to report that continued step out drilling has so far successfully intersected visible gold mineralization in each hole targeting the High Grade Zone. The Company is actively and aggressively advancing the exploration program on the EGZ and looks forward to results from the ongoing drilling. The results of this ongoing near-surface drilling will enable the Company to understand the geometry and nature of the EGZ which will help to prepare an expanded drill program to target the system at depth. In addition, the Company is pleased to report the results from the lower portion of PE-19-26 which intersected a portion of the Low Grade Zone 2 (“LG2”) with 0.5 g/t Au over 9 m including 5.58 g/t Au over 0.45 m and an additional LG2 intersept in PE-19-25 of 3.57 g/t Au over 0.6 m.
The EGZ was discovered in December of 2017 during a regional exploration drilling campaign. The discovery hole, PE-17-03, identified two zones of near-surface mineralization, called the High Grade Zone and the Low Grade Zone, which returned values including 12.22 g/t Au over 4.66 metres and 0.81 g/t Au over 76.5 metres, respectively. Follow-up drilling in 2018 in drill hole PE2018-17 intersected values including 269.23 g/t Au over 1.35 metres and 0.74 g/t Au over 20.75 in the High Grade Zone and Low Grade Zone, respectively. Following this, an aggressive exploration program totalling approximately 3,000 metres targeting the High Grade Zone has begun, from which assays have returned grades including 393.33 g/t over 1.7 metres in PE-19-22, 39.58 g/t Au over 0.75 metres in PE-19-23, 214.71 g/t Au over 0.65 metres in PE-19-24, and 56.75 g/t Au over 8.5 metres in PE-19-27. Maxime Bouchard M.Sc.A, P.Geo and V-P of Laurentia Exploration, an Independent Qualified Person as defined by Canadian NI 43-101 standards, has reviewed and approved the geological information reported in this news release. The drilling campaign and the quality control program have been planned and supervised by Maxime Bouchard and Amex’s management. The quality assurance and quality control protocol includes insertion of blank or standard every 10 samples on average, in addition to the regular insertion of blank, duplicate, and standard samples accredited by Laboratoire Expert during the analytical process. Gold values are estimated by fire assay with finish by atomic absorption and values over 3 ppm Au are re-analysed by fire assay with finish by gravimetry by Laboratoire Expert Inc, Rouyn-Noranda. Samples containing visible gold mineralization are analyzed by metallic sieve. For additional quality assurance and quality control, all samples were crushed to 90% less than 2mm prior to pulverization, in order to homogenize samples which may contain coarse gold. Core logging and sampling was completed by Laurentia Exploration (Maxime Bouchard, P.Geo and Alizée Lienard GIT, both M.Sc.A).